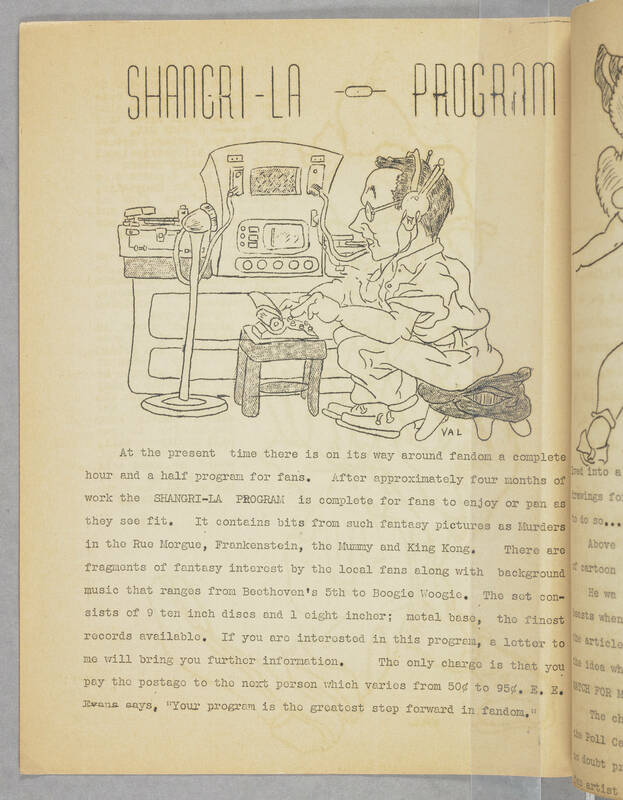 SHANGRI-LA - PROGRAM [image: line drawing of man on low stool typing on typewriter, dishevelled, shirt sleeves rolled up, headphones on, that connected by cable to a large box with knobs and a microphone also plugged into it. Image is signed 'VAL'] At the present time there is on its way around fandom a complete hour and a half program for fans. After approximately four months of work the SHANGRI-LA PROGRAM is complete for fans to enjoy or pen as they see fit. It contains bits from such fantasy pictures as Murders in the rue Morgue, Frankenstein, the Mummy and King Kong. There are fragments of fantasy interest by the local fans along with background music that ranges from Beethoven's 5th to Boogie Woogie. The set consists of 9 ten inch discs and 1 eight incher; metal base, the finest records available. If you are interested in this program, a letter to me will bring you further information. The only charge is that you pay the postage to the next person which varies from 50c to 95c. E. E. Evans says, "Your program is the greatest step forward in fandom."